The Economist wonders what’s the cinematic model for Mitt Romney’s shifting, unstable selfhood. Is his campaign really a subtle work of art beneath the sales pitches, “a meditation on the nature of identity and memory”? Is the man like Jason Bourne: waking with amnesia to find that somebody else has decided who he is, and he’s on the lam from the sinister identity imposed on him? Did the CIA train Mitt Romney as a cold, superefficient liberal assassin, and is he just trying to fight his way back to the nice, normal, Midwestern Tea Partier he was before they got their claws in him? Or is he like Leonard Shelby in Memento, his long-term memory completely shot, no continuity in his life beyond the ten-minute mark, forced to tattoo reminders on his body of who he actually is and what he’s striving for? How many people have ever seen Mitt without his shirt on? Or is he like those guys in Eternal Sunshine of the Spotless Mind, who willingly erase their own memories of pain or loss to start over, like an Etch-a-Sketch, with a blank slate? Did Mitt press the buttons for his own eighteen-and-a-half-minute gap? the American equation of freedom with the possibility of reinventing oneself. These big, chiselled men with their blue suits, asserting their right to invent themselves as exactly whoever the public wants them to be right now: where have we seen them before? They’ve been with us since the birth of the modern American moment. Jay Gatsby. Roger O. Thornhill. (Eva Marie-Saint: “What’s the O stand for?” Cary Grant: “Nothing. I made it up.”) Most recently, of course, Don Draper. I can buy that. But there’s one movie precedent they left out: another Matt Damon role, the talented Mr. Ripley, a bounder who knows perfectly well who he is, but wills, and kills, to turn into something else. 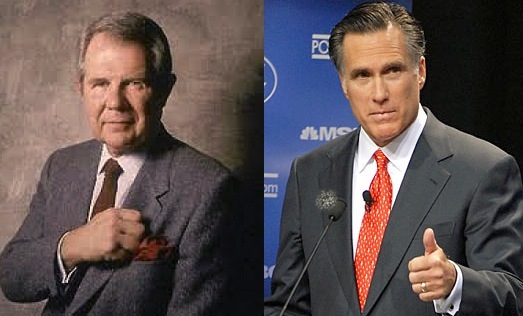 I can easily see Romney inviting Pat Robertson out for a boat ride in the sunny bay, then shoving him overboard and taking on his identity to preach the Sunday sermon, if Mitt thought it would help him get the God vote. Maybe it’s already happened — heard from Pat lately? They even look alike.